Justice Howie’s sentencing remarks on sentencing Sarah Ward for the murder of Eli Westlake in June 2008 have now been published (R v Ward  NSWSC 304). I wrote most of the following as a postscript to another post which discussed this case in another context, but it is really a standalone post. Ms Ward said at the trial (as reported in the press at the time) that she did not mean to drive over Eli Westlake. She said her foot got stuck on one pedal or another and the passenger took hold of the wheel. That was a question for the jury and they must have rejected this account. the person is to be found guilty of manslaughter only. The difficulty for Ms Ward with this defence was that there was some question as to the underlying condition (she has since been diagnosed as bipolar) and because she was intoxicated. The section requires that the effect of intoxication be disregarded. Whilst it is up to the jury to return the verdict, it is up to the judge to make more detailed findings of fact consistent with that verdict. Justice Howie’s account is at paragraphs 4 to 13 of the sentencing remarks. These are that the interaction between Eli, his brother Joel and another friend started with Ms Ward driving the wrong way down a one way street where Eli and his companions were walking on their way home from a pub. They said something to her, the cheeseballs were thrown, and from there the altercation escalated. Both sides were drunk, but Ms Ward and her companion seem to have been the ones who took the altercation to a higher level. They could always have just driven away, whatever was said. The passenger got out of the car to take the argument further at one point (and then retreated). Ms Ward also got out of the car later, and fell to the ground when Joel Westlake (Eli’s brother) retaliated when she was physically attacking him. The three young men walked away from the car to join their companions further away. It was Ms Ward who escalated the encounter to a fatal level by driving at Eli, not once, but twice. It is a sobering reminder that you can never be too careful when dealing with strangers. You just don’t know who they are. As emerged on sentencing, Ms Ward had quite a history of “anger [mis]management” events, especially when drunk. Amongst other things, she had (when drunk) stabbed her then husband twice with a kitchen knife during an argument with him, when he was lying face down on a sofa. On another occasion she saw a woman who owed her money lying on that woman’s bed and climbed through a window to assault her. Justice Howie mentions that she was also charged with assault but I take it from this that in fact she was not on that occasion convicted of assault. These were not the only incidents. Sentencing is a complicated thing unless you are an expert in the field. As I understand it, the maximum penalty for murder is life, but under section 21(1) of the Crimes (Sentencing Procedure) Act, a lesser penalty may be imposed, and normally is – often 25 years (I’m a bit vague about the exact basis for this). Normally, anyway, it is the non-parole period which is most important. That is the minimum term the prisoner must serve. Section 54A of that Act then sets out standard non-parole periods which are to apply to “mid-range” offences. Under section 54B, a decision by a judge to set a longer or shorter period must be supported by reasons, which can only be those provided for in section 21A. Justice Howie is one of the tougher judges. He held that the offence was a mid-range offence, though it is hard to imagine him ever finding that any murder was anything less, other than what he described (at ) as “the typical case of murder coming before this Court,” namely “domestic killings usually in the heat of the moment and often fuelled by alcohol” which he stated are “probably lower than mid-range.” He was of the view that this case was “more serious than that.” The use of the car as a weapon was an aggravating factor under section 21A(2)(c) of the Crimes (Sentencing Procedure) Act, as was the grave risk of death (section 21A(2)(ib)) to the other person whom she struck with the car. He allowed some reduction of the standard non-parole period on account of Ms Ward’s remorse. He sentenced Ms Ward to 25 years’ imprisonment, with a non-parole period of 18 years 9 months and a balance of term of 6 years 3 months. As Ms Ward has been in prison since the accident in June 2008, this means she will be eligible to be considered for parole on (and not eligible to be released before) 6 March 2027. I have previously posted about the Opera Australia 2010 AGM, and referred to its 2010 Annual Report and Financial Report. The meeting and the company’s results were covered by Raymond Gill in the Age and Bryce Hallett in the SMH. In the Sydney summer season last year, admissions to the opera fell from 86,518 in 2008 to 77,860. Admissions fell by 32 per cent in Melbourne’s autumn season, with 45, 917 people going to the opera compared to 68,454 the year before. These are the figures in the Annual Report. The top-selling shows last year were Graeme Murphy’s new version of Aida and the perennial crowd-pleaser The Mikado, starring Anthony Warlow. The company’s Melbourne box-office income was worse than Sydney’s, including a new staging of Stephen Sondheim’s A Little Night Music, which failed to meet expectations. About 14,000 tickets were sold for its 21 performances at the Arts Centre against almost 32,000 tickets for Madama Butterfly’s 23 performances at the Opera House. A Little Night Music , starring Sigrid Thornton and Warlow, opens the Sydney winter season in June. Unless you were reading carefully, you might have missed a subtle distinction here. Raymond Gill refers (as does the Annual Report) to “attendances.” Bryce Hallett talks about “top-selling shows.” The annual report does not give any figures as to how many tickets were sold. Nor does it provide a breakdown of “attendances” for individual productions. I would be interested to know exactly what information Bryce Hallett was given, being information which was not provided to members of the company. My guess is (because otherwise, how could he say what shows were top-selling?) is that it was the company’s box office analysis. As a company limited by guarantee, Opera Australia is a public company. If it were a listed public company, such selective leaking would be distinctly non-kosher behaviour. Opera Australia is different and those principles do not apply in the same way to it because, as it is a company limited by guarantee, its members are not shareholders and there is no question of the value of their investment or the protection of the integrity of the market in those shares. Incidentally, this is one reason why I do not agree with Dr Switkowski’s justification offered at the AGM of the board’s approach to appointing new members by analogy with the conduct of the boards of other public companies. Cosy board conduct on a listed public company is subject to ultimate sanctions of shareholders voting with their feet on the market or actually voting according to the value of their shares to protect the value of their investment. Moreover, the board of a company limited by shares has a historical mandate from its shareholders which distinguishes itself from OA’s self-selected incumbents. A review of Opera Australia’s operations by L.E.K. Consulting found that the company was hard-working and productive but recommended several options concerning ticket prices, yield management and programming. It advocated that revivals of more popular operas be turned around more quickly. It is the point about “yield management” which particularly intrigues me. I think that means, as for airlines, how to maximise the bums on seats and, in particular, how to sell hard-to-shift seats for the best monetary return. Airlines mostly do this by lowering the price. It is far from obvious that the best approach to this is to give those seats away or to sell them at concessional rates to employees of the company and their friends. Andrew Byrne has complained about evidence of this practice on a number of occasions. I too have occasionally commented on this blog about Opera Australia’s failure to take an imaginative approach to selling tickets of less well-supported productions. It seems they would rather give the tickets away (or sell them cheaply) to their staff and their friends than sell them at a cheaper price than the initially offered price to a broader public – which I suppose is thought to risk devaluing the brand. Amazingly, I learnt after this year’s meeting (and so, not entirely by accident in my view, too late to raise at the meeting) that for every ten paid ticket-holders at the mainstage productions there is one person who is not. Some (but surely not much) of this will be promotional comps. Perhaps it also includes student rushes, but mostly I expect it means the free list or company rush. It isn’t across the board: few tickets are given away or concessionally sold for the box office hits, but conversely, the proportion of such attendances must be considerably higher than 9% for those shows which are not pulling in the paying punters. Surely some of those seats could be sold at better rates than that if the company were just prepared to face up to facts earlier and lower its prices, if not to the world at large, then to targetted groups including those where there may also be audience development advantages. To take the example provided by Mr Hallett above, the average ticket sales in Melbourne for A Little Night Music of only about 700, in a theatre with a capacity of just over 2,000, must have been apparent long before the end of the run. Even if the company doesn’t want to cannibalise its existing or potential future sales, then perhaps it could offer extra tickets to its subscribers and others who had already bought tickets and who are contactable by email. But it needs to do this sort of thing early enough for there to be takers at a reasonably rewarding price. There is an element of judgement here of course, but at present if the company holds out for big sales at full price and they don’t come, then it’s handouts or near-handouts for the staff and their friends all round. Nice for them, but in its own way a kind of rentseeking on their behalf by default, and not really good for the company. To take another example, I am sure something could have been done in this way to rescue the sagging sales of and disappointing attendances at Werther and Lady Macbeth in last year’s Sydney summer season. I don’t want to anticipate what the company’s next “unpopular” work will be, but I don’t think many works are unpopular at any price. It would be good if, when the time arises, we can see signs of a more flexible and creative approach to this issue than there has been to date. Last night to UNSW with P to hear the Australia Ensemble. There are times at concerts when the practice of sitting in a room listening to some people playing instruments or singing out the front seems to me rather odd, and I wonder: “What am I doing here?” I had some such thoughts when watching Geoffrey Collins and Catherine McCorkill behind enormous sheaves of music and playing the Villa-Lobos. I just couldn’t get what the music was trying to get at; the flute part just had too many notes, and the moments of meeting between the flute and the bass clarinet seemed intermittent. Fortunately, that wasn’t the case with the Shostakovich which opened the concert. It started intimately, rather inwardly: I was in no doubt why I was there and there was something even comforting as well as beautiful in the music’s embrace. And along with slow movements, I’m always a sucker for any muted strings, featured in the third movement. By the last movement, things were a little more unleashed and something more of the familiar struggling Shostakovich and “contending” string quartet style was in evidence for a virtuosic big finish. The highlight of the concert for me, however, was the Schumann Piano Quintet. Right from the start, you know “this is real music.” I know that sounds reactionary, but I don’t really think this is to do with the comfort of a diatonic style. It really is to do with the strength and vigour of Schumann’s musical conception, which is there right from the movement’s forthright start. Afterwards, P and I discussed the difference between this performance of the Schumann and the last time we heard the AE do it. We both agreed that the Steinway (as opposed to the Stuart piano) was a big factor. P thought it made some things better; I thought it raised the spectre of Schumann’s notorious tenor/alto register murkiness. The first half closer, Entomology, was written by Nigel Westlake, who is a former clarinetist in the ensemble (I think he must have succeeded Murray Khouri and preceded whoever preceded Catherine McCorkill). Written in 1990 for the Seymour Ensemble, it uses a tape of insect noises but also some percussion. The tape has a kind of click track built into it to give the cues to the performers: in the middle section the tape, as far as I could gather, stops, and then restarts after a pause for the finish. It was quite jolly music, though for me this is a bit of a slippery slope, particularly once there are recorded instruments on the tape: why not put everyone on the tape and then we can just listen to it at home on the stereo? Ms Ward is yet to be sentenced. I expect that sentencing remarks will give a more precise account of what happened than has so far been published. From what I can gather, the whole trial was over the issue of what Ms Ward’s intent was. Under section 18 of the Crimes Act, you are guilty of murder if you did not actually intend to kill a person but you did intend to inflict grievous bodily harm upon some person (ie, not necessarily the person who ended up being killed). However, there is an element of legal fiction in that – that is to say it may not really hang on the accused’s actual intention, because in judging a person’s intention, the effects of intoxication are generally disregarded, and people are taken to have intended the usual consequences of their actions. Driving a car at someone usually or in a great many cases causes them grievous bodily harm – and it’s not as if Ms Ward just drove at Eli in a casual or accidental way. Justice Howie’s sentencing remarks can now be read here. Whilst it is up to the jury to return the verdict, it is up to the judge to make more detailed findings of fact consistent with that verdict. Justice Howie’s account is at paragraphs 4 to 13 of the sentencing remarks. These are that the interaction between Eli, his brother Joel and another friend seems to have started with Ms Ward driving the wrong way down a one way street where Eli and his companions were walking on their way home from a pub. They said something to her, the cheeseballs were thrown, and from there the altercation escalated. Both sides were drunk, but Ms Ward and her companion seem to have been the ones who took the altercation to a higher level. They could always have just driven away, whatever was said. The passenger got out of the car to take the argument further at one point (and then retreated). Ms Ward also got out of the car later, and fell to the ground when Joel Westlake (Eli’s brother) retaliated when she was physically attacking him. The three young men walked away from the car to join their companions further away. It was Ms Ward who escalated the encounter to a fatal level by driving at Eli, not once, but twice. It is a sobering reminder that you can never be too careful when dealing with strangers. You just don’t know who you are dealing with. As emerged on sentencing, Ms Ward had quite a history of “anger mismanagement” events, especially when drunk. Amongst other things, she had (when drunk) stabbed her then husband twice with a kitchen knife during an argument with him, when he was lying face down on a sofa. On another occasion she climbed through a window to assault a woman (who was lying on her bed) from whom she sought the repayment of some money. The difficulty for Ms Ward with this defence was that there was some question as to the underlying condition (she was subsequently diagnosed as bipolar) and because she was intoxicated. The section requires that the effect of intoxication be disregarded. It is a tragedy, for Eli and the Westlake family, but also, as Nigel has been quoted as saying, for the woman and her family. The program bore a note that in support of the Westlake family the musicians of the Australia Ensemble dedicated the performance to the Smugglers of Light Foundation, which has been set up in Eli’s memory to assist indigenous musicians and promote the performance of community music. Today was D’s birthday. D prefers the ballet to the opera, and his birthday falls in the ballet season. In what could well become an annual event (so long as he and I are spared) we went to the Australian Ballet, in this case to Graeme Murphy’s hommage to and balletic adaptation of Der Rosenkavalier, The Silver Rose. This was originally commissioned for performance in Munich, in the very theatre (well, rebuilt after the you-know-what) where Strauss’s opera received its premiere. Perversely, one might have thought, the music is not an adaptation of Strauss (presumably still in copyright – amazingly) but rather by Carl Vine. Vine cobbled together a score made up of adaptations/extracts of 20 years of concert music. I probably should have recognized some of it, were I more familiar with his oeuvre or were it more distinctively memorable. The music was effective and particularly featured piano concertante moments, well-played by Stuart Mayne. These were obviously amplified: I wondered if a Disklavier was being used; an off-duty AOBA violinist told me afterwards the whole orchestra was amplified. If this were the opera, I would be concerned, but I’m less jealous of acoustic values at the ballet, and once one instrument is amplified it’s probably appropriate to do the lot for the mix. Carl Vine has a fluent and very approachable style. Sometimes perhaps it is a bit too much of both: the music for the presentation of the rose reminded me of nothing so much as Western (as in Bonanza) music (OK: I know this begs the question of why this music is used for Westerns, which probably is related to the Mitteleuropan origin of “Red Indian” music) beloved of cigarette or beer advertisements. Think Marlboro Country or VB. At least those were the sorts of pieces I thought of, though once I relisten to those particular pieces the resemblance is less than it seemed on reminiscence in the theatre. I’m not a balletomane and it always takes me a while to accustom myself to ballet’s narrative mode. Things warmed up in the second and third acts. For my taste, the third act could have made a bit more of both the Mariandel part of the action and also the balletic version of the big trio towards the end. It all seemed to flash by rather quickly if you are used to operatic notions of time. The set was very handsome (Bavarian money helped, I expect, even if we owe this production to the fact that after only 5 years they apparently couldn’t afford to keep the sets in storage: We’re sorry, we’re going to have to let you go – which rather suggests that this ballet did not capture the Münchners’ hearts and minds). As seems to now be a convention when there is an anachronistic transposition, it was set in Straussian Jugendstil rather than Maria-Theresan roccoco. The costumes were a little more chronologically eclectic, though the suggestion in the program notes that the police uniforms were inspired by Gestapo uniforms seems like a bit of uninformed SBS-Hitler-Kitsch. Assisted in a postmodernist way by my familiarity with teh opera, I found myself moved, even to tears, by the end (D took my hand). Ah, chocolate box romance! – Bitter-sweet, of course. I’m not sure the ballet without any knowledge of the opera would have had quite the same effect. Which is to say that my appetite is whetted for the real thing, which is coming up at the end of Opera Australia’s season in October this year. I remain amused at the Ballet’s vigilance in reminding ballet-goers on concessions by preshow announcements over the PA system that they must be ready to present evidence of their concessional entitlement at the theatre-door. Are such challenges actually issued by the Opera House staff, or are these announcements just an indirect manifestation of the rigours of balletic discipline (with corresponding authoritarianism) and a long-ago bee in somebody’s bonnet? This afternoon I attended the OA AGM. This is a classical “tea and bikkies” affair, which is to say the board disclose as little sensitive or potentially embarrassing information as they can get away with in order to have the necessary formal resolutions passed. The chairman, Dr Switkowski proclaimed: “We are amongst friends here.” Just in case he was mistaken, Dr S had 33 proxies, all of which he indicated he would cast in favour of the formal resolutions on the agenda, including appointment of one retiring and two casually appointed members of the board, and the adoption of the 2009 annual accounts. As, at the commencement of the meeting, there were 29 members present in person, one might fairly say that the meeting was fairly securely stitched up. There was little point in being contrary; no votes were cast against any of those resolutions, though there appeared to be some abstentions on the elections of the board members. You can download PDF versions of the annual report here, and the financial report (which also appears in the annual report) here. You can also download copies of the 2007 and 2008 annual reports from this page. The company recorded an operating loss of a little over $900k last year; Adrian Collette indicated that he expected a similar figure this year. Last year started badly (I remember the very disappointing houses for Werther and the well-papered houses for Lady Macbeth of Mtsensk) it was Aida which saved the company’s bacon. The company’s cash position has improved. The impact of the GFC on consumer behaviour has clearly not yet abated [general indications seem to be that the trough may get deeper once the initial stimulus cash stops sloshing around quite so much]. As Mr C and Dr S both pointed out, the company cannot continue to make losses like this and they will need to be made up. As is reasonably well-known, seasons are planned 2 to 3 years out. Mr Collette said that at present they were running a bit later than that because of the appointment of Lyndon Terracini as artistic director and [my interpretation] a decision to hold back decisions until his arrival. What that probably means is that we can expect a[n even] greater emphasis than usual on box office and less tolerance of risk [than ever] in 2012 and 2013. There were, as ever, allusions to exciting developments which cannot yet be mentioned. Rather oddly from a point of view of corporate governance, in my opinion, the company and Dr S and Mr C had less compunction when speaking to Raymond Gill and Bryce Hallett of the Fairfax press. I intend writing about that more later, and in particular about what may or may not be in the mysterious management consultants’ report which Opera Australia obtained. In February this year the NSW Government announced that the existing light rail from Central to Lilyfield would be extended along the only-recently-disused goods line from Rozelle to Dulwich Hill. Tonight I attended a “community forum” convened by Carmel Tebbutt and Linda Burney, two local state parliamentarians. 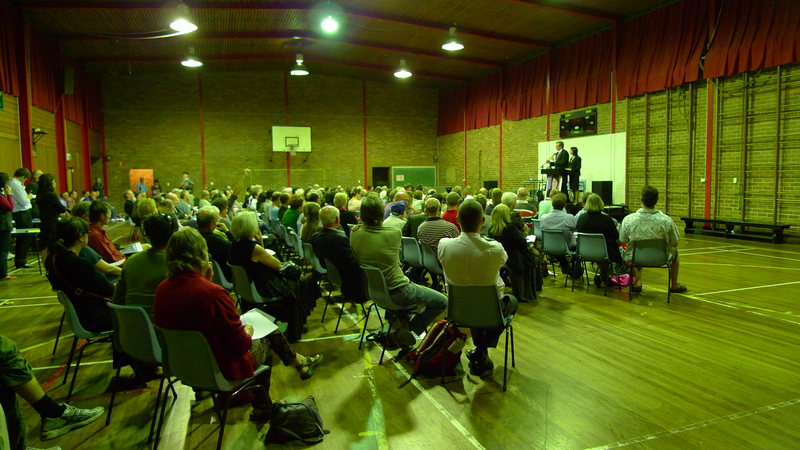 It was held in the gym (which is probably the closest approximation the school has to a hall) at the gloriously-named Dulwich Hill High School of Performing Arts and Design. This just so happens to be the place where I generally get to cast my vote. I didn’t get there at the start (6pm – are you serious?). The picture above was taken from my vantage point at the sidelines. I don’t go to many “public meetings,” but on my own limited experience I would say this meeting was fairly well-attended. Election posters displayed out at the front of the school for Mesdames Tebbutt and Burney suggested that they think they are on to a real winner here and that, from their point of view, notwithstanding the conscription of a number of bureaucrats (including the fellow pictured on the dais whose name I did not catch) this was a thinly disguised campaign meeting. But it wasn’t quite as simple as that. 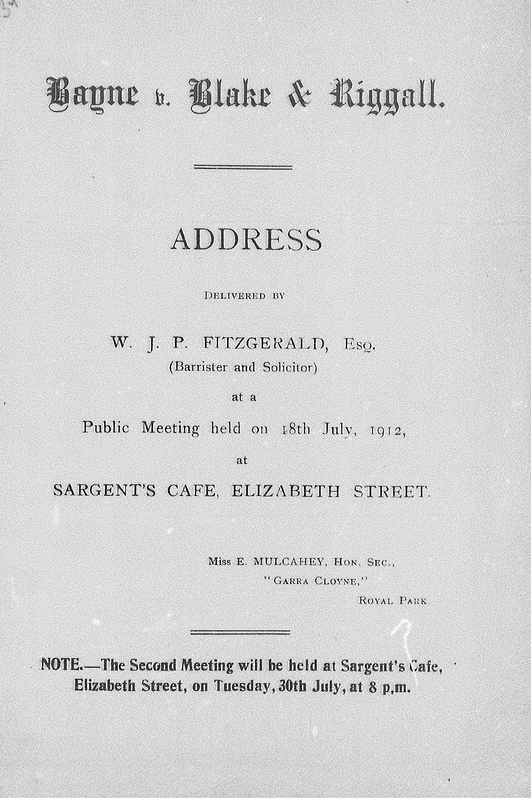 Although the format of the forum was for Ms Tebbutt to invite questions, a number of questions disguised as speeches were given, and in particular by representatives of the friends of the greenway. I’ve got a lot of sympathy for this group. 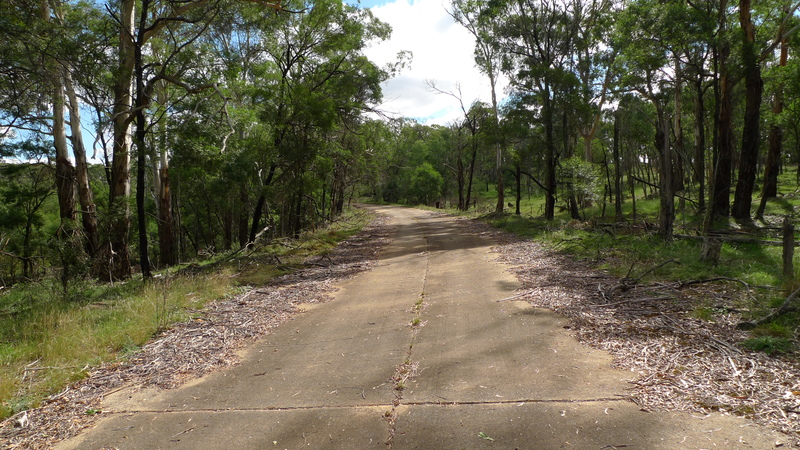 For years they have been agitating for the completion of a “greenway” along the goods line corridor between the Cooks River and the Parramatta River. By that I think they mean a pedestrian and cycling link which takes advantage of and preserves or even regenerates the vestiges of nature which have been preserved or which have fortuitously reemerged as a result of the decrease in use of the goods line over time. Now the state government has announced, willy-nilly, in a bout of pre-election panic, the extension of the light rail, but (in the spirit of the law reforms by the Federal Government on gay relationships for welfare beneficiaries: you want it, you’ve got it and now you can lump it) without any assurances that this will be done in conjunction with a cycleway/pedestrian path or with any respect or sensitivity for what little bush has been regenerated along the corridor. It’s a tricky situation, because my guess is that the greenway people (and if so, I agree with them) are generally in favour of the use of the existing rail line as a light rail, but they don’t want just any old light rail link, and they are (as I am) rightly suspicious of what might actually be done in the name of giving the people what it will be said (as with gay old age pensioners) they have been asking for. The fact is, we (you’ll see I’m presuming to make common cause) want a light railway, but not on any old terms. There is more to be said about this proposal, if only because it is obvious that not much has been worked out. In particular, it was clear at the meeting that, even if, as claimed, construction of the extension is funded, its operation most definitely is not. Undoubtedly, the current owners (I think lessees) and their operators of the light rail to Lilyfield have got the State Government over a barrel, because presumably their contract still has some time to run, and it hardly makes any sense for there to be two different operators of the old and new segments of the line. If the extension runs at the prices of the present light rail, it will be very expensive. Few will use it. It will be like the Airport rail extension and Cross-city tunnel. It all depends on how determined the state government is to recoup the “funded” cost of the construction of the extension from whoever gets to run it once it is built, and what price (including, if necessary, replacing the present owners and paying them out, if need be) the state government is prepared to pay to bring the light rail fares in line with the new scheme of universal public transport pricing. I predict a minefield ahead. Because the government has already announced it will go ahead with this, just to mix my metaphors up a bit more, it is not only over a barrel, but a bit of a sitting duck. Over Easter, I went to Canberra to see my father. It had been my aim to leave early on Maundy Thursday, but an impending directions hearing in a vexed matter with a very difficult opponent the next Wednesday and a rude letter from their young solicitor full of false issues and accusations which was nicely calculated to wind me into a fury (so difficult to avoid being drawn into this sort of thing!) put paid to that. So, despite vestigial religious scruples, I found myself driving south to Canberra on Good Friday. The traffic was heavy though fortunately devoid of commercial vehicles and after some protracted crawling at 20-30 kmh past Campbelltown, conditions eventually returned to normal somewhere a bit before the Mittagong turn-off. “Normal,” these days, really means everyone burling along at close to if not above the speed limit. Except for the very biggest hills or the odd caravan or learner driver, there are very few vehicles now on the road not capable of that: there can certainly be no particular cachet in being able to keep up a good speed. Aside from improvements to vehicles, we have the dual carriageway and the completion of bypasses round every town to thank for that. I’m grateful for the ease and speed of the trip, but it does make for rather bland driving. This time, I explored the turn-off. The old road survives as the access to a number of properties. Stoutly constructed (experts could presumably date its construction by the use of concrete in this way, which I think of as a 1940s mode) it is now more than adequate for its present purpose, even as it shows signs of returning to nature. 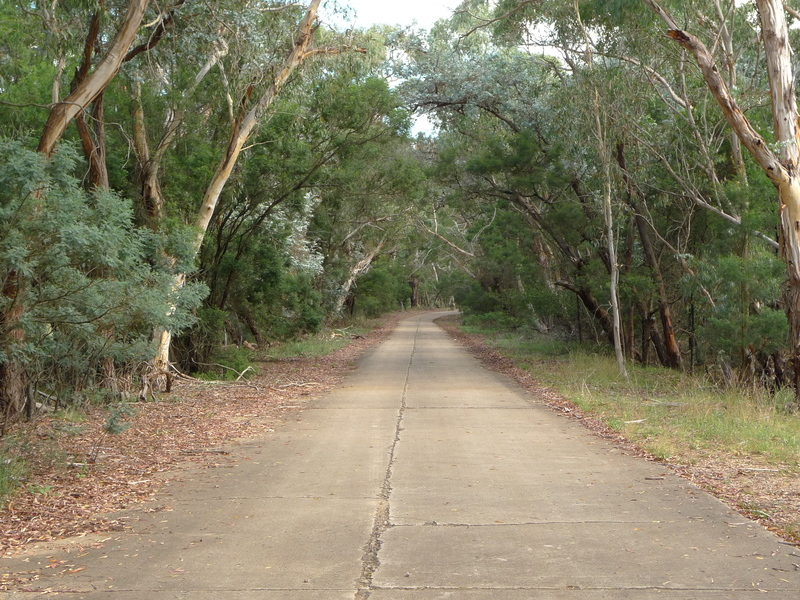 There are other similar (though less overgrown) stretches of the old Federal Highway between Canberra and Lake George, including some which I distinctly remember from close encounter in long weekend traffic jams as I desperately sought, in the years of my youthful Canberran exile, to escape whenever possible to Sydney. Then I loathed such winding delays. Now, nostalgia and the lack of necessity, lend a certain charm. I have written before about Wendy Hatfield and her attempts to get to see in advance of the broadcast by way of preliminary discovery episodes of the impending TV series Underbelly III, which she expects (on good grounds) will defame her. That application was rejected by Justice Harrison. On 8 April, an appeal to the Court of Appeal was dismissed  NSWCA 69. Basically, the Court of Appeal held that Harrison J had made quite a lot of mistakes, including (on a quick reading) in relation to Royal Commission transcript and what you have to establish to come within the rule for preliminary discovery. However, when it came to the exercise of discretion to award preliminary discovery, the court decided that it would not have exercised the discretion to award preliminary discovery any differently (and it is a discretion, not an order made of right). This was because the utility of preliminary discovery was in order to attempt to gain an interlocutory injunction to prevent the defamation and the usual free speech issues (amongst other things: there was also the question of an undertaking as to damages though this was probably not determinative) would have precluded such an injunction being granted. 130 However, one point did seem to emerge from what was said and not said in submissions from the respondents’ camp. It would seem that the program makers did not feel sufficiently confident to portray the primary male figure as a gangster and criminal, but felt that it was open slather to cast dirt upon the relatively defenceless woman appellant, a retired member of the police service, because it thought it had a defence of truth because of what occurred at the Wood Royal Commission. You are currently browsing the Stumbling on melons blog archives for April, 2010.